Peek Freans Sooper Proves - Sooper Hai Pakistan...!!! This year, on the 70th Independence Day, Peek Freans Sooper decided to unite the country under one umbrella with the inspiring message “Sooper Hai Pakistan”. EBM family along with known celebrities and heroes of the country, came together to set a world record and to make the nation truly proud. 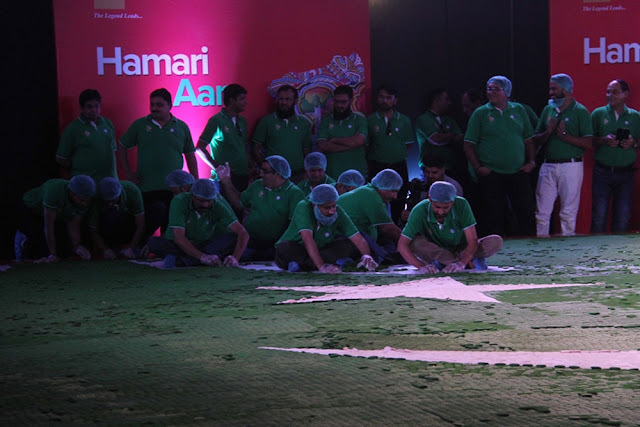 Their aim was to break the Guinness World Records title for the Largest Cookie Mosaic in the shape of Pakistan’s flag. 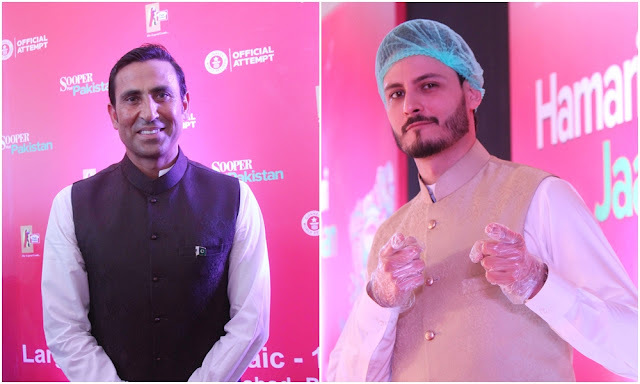 On 14th of August, 2017, the record breaking event took place in Islamabad and was attended by a number of celebrities like Younis Khan, Shoaib Akhtar, Adnan Siddiqui and Hareem Farooq. The whole team worked with great enthusiasm and passion as they slowly pieced together the mosaic using Peek Freans Sooper cookies in green and white color. During all this process of creating the largest cookie mosaic, the factor of hygiene was properly taken care of. Food inspectors also inspected the process to make sure that everything was up to the standards. Not only the people who were actually present at the venue were excited to create something big but many so many Pakistanis showed much enthusiasm and appreciation over the internet for this record. With hard work, devotion and efforts of the team, the Pakistani flag mosaic was finally completed in almost 6.5 hours. Peek Freans Sooper finally made the Largest Cookie Mosaic in the shape of Pakistan’s flag made with 150,000+ cookies measuring 226.51 m2 (2,438.15 ft2). The official announcement was made later by the brand that Peek Freans Sooper has officially broken the GuinnessWorld Records title for the Largest Cookie Mosaic in the shape of Pakistan’s flag. Upon completion of the cookie mosaic, the biscuits were distributed in custom built containers to notable charities across Pakistan which is another great effort. I can truly say, Peek Freans Sooper and the whole team who took part in achieving this sooper record made Pakistan proud. With unity, devotion and hard work, we can surely achieve anything. Press Release: Maybelline New York Celebrates #MakerWomen Who #MakeITHappen...!!! Following the launch of the Maker Women celebration movement with the release of anthem “Humsa Ho Tou Samnay” in Pakistan, Global trend setting brand, Maybelline New York held a soirée in Karachi to celebrate women who make It happen, hosted by the brand and their spokesperson, celebrity Ayesha Omar. The soirée included a special screening of the anthem and a live musical performance by vocalist Alicia Dias. In attendance at the event were powerhouses from the entertainment, fashion, film and acting fraternities including Mansha Pasha, Hira Tareen, Nadia Hussain, Zhalay Sarhadi, Wardah Saleem, Maliha Aziz, Kiran Aman, Tapu Javeri, Ali Safina, Adeel Hussain, Sana Bucha, Huma Nassr, Frieha Altaf, Saima Rashid Bargfrede, Adnan Pardesy, Sanam Chaudhri, Areeba Habib, Rubab Hayat, Huma Amir Shah, Saad Hayat and Junaid Khan. “Humsa Ho Tou Samnay Aye” celebrates women and the strength that they stand for; ‘Maker Women’ who are the heroes of their own lives and who Make IT Happen every day. The video features Actor and Maybelline New York brand ambassador Ayesha Omar, musician Zoe Viccaji, artist Naveen Shakil, MMA fighter Sarah Tareen, story teller AlinaEhtesham and unfolds against the soulful voice of maestro Ali Sethi. For Maybelline, a #MakerWoman is someone who wakes up every morning and walks out into the world like it’s her own. She owns it. She faces challenges by standing up and making her voice heard. She embraces life and is proud of her individuality. She is bold, fierce and unstoppable. Above all, she believes in her ability to #MakeItHappen. She is a movement. The #MakerWoman is all around you. She is the woman juggling deadlines at work, the woman turning her house into a home, the woman that is journeying her world, evolving within and without. She is the woman staring right back at you in the mirror. Maybelline New York’s Maker Woman is YOU! Synonymous with its inspiration, the women in the brand film are MAKERS of their own destiny; women who each day, seize and embrace their journey; that create their journey. The anthem is a true manifestation of the Maybelline legacy; to celebrate the power of YOU.